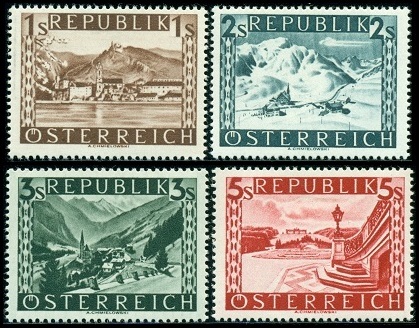 Republic of Austria stamps, for the Second Republic, officially appeared, beginning in November 1945. 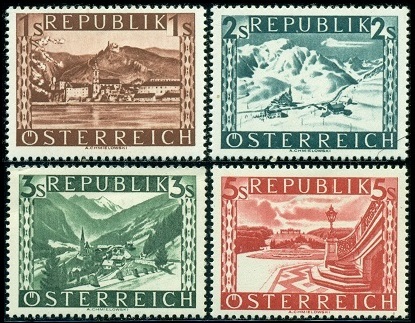 These stamps are considered the first official postage stamps of the Second Republic of Austria, as they were valid throughout the country and throughout all the Allied Occupation zones. When a new (or reborn) country issues its first definitive postage stamps, everything is required, from the lowest denomination to the highest denomination, and this landscape definitive postage stamp series did just that. Over the period from 1945 to 1948, fifty-three different stamps of this definitive series were issued. 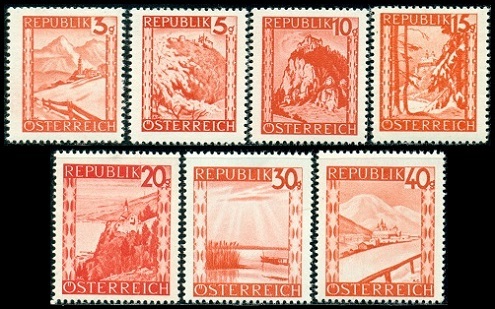 The twenty-nine Groschen denomination Landscape pictorial definitive stamps shown above (Mi. #738-66, Sc. #455-77, #483-88) began appearing in November 1945, continuing through January 1947. These new Republic of Austria stamps are all photogravure and either perforated 14 x 13 1/2 or perforated 13 1/2 x 14. 03 G. - Lermoos, Tyrol. 04 G. - Erzberg, Styria. 05 G. - Leopoldsberg, Vienna. 06 G. - Hohensalzburg Castle, Salzburg. 08 G. - (Brown Ocher) Prater Woods, Vienna. 08 G. - (Plum, Olive Brown) City Hall Park, Vienna. 10 G. - Hochosterwitz, Carinthia. 12 G. - Schafberg, Upper Austria. 15 G. - Forchtenstein Castle, Burgenland. 16 G. - Gesäuse Valley, Styria. 20 G. - Chapel by Lake Constance, Vorarlberg. 24 G. - Höldrichs Mill, Lower Austria. 25 G. - Ötz Valley Outlet, Tyrol. 30 G. - Neusiedler Lake, Burgenland. 35 G. - Belvedere Palace, Vienna. 38 G. - Langbath Lake, Upper Austria. 40 G. - Mariazell, Styria. 42 G. - Traun Lake, Upper Austria. 45 G. - Hartenstein Castle, Lower Austria. 50 G. - Silvretta Mountains, Vorarlberg. 60 G. - Semmering, Lower Austria. 70 G. - Waterfall at Bad-Gastein, Salzburg. 80 G. - Kaiser Mountains, Tyrol. 90 G. - Wayside Shrine at Tragöss, Styria. The four Schilling denomination Lansdcape definitive stamps shown above (Mi. 767I-70I, Sc. #478-81) were issued in May and June 1946. These new high-denomination Republic of Austria stamps are all photogravure and perforated 13 1/2 x 14. On the original printings, shown above, the upper and lower panels have a screen effect, as shown in the graphic directly above. 01 S. - Dürnstein, Lower Austria. 02 S. - St. Christoph am Arlberg, Tyrol. 03 S. - Heilligenblut, Carinthia. 05 S. - Gloriette at Schönbrunn Palace Park, Vienna. 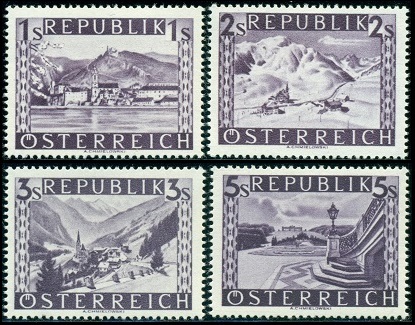 The designs of the four Schilling denomination Landscape definitive stamps shown above (Mi. #767II-70II, Sc. #496-99) were re-drawn, and they were re-issued in August 1946. On the re-drawn printings, shown above , the upper and lower panels have a solid effect, as shown in the graphic directly above. 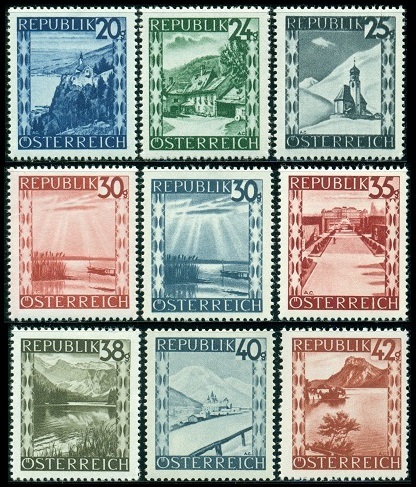 The sixteen Landscape-type definitive Austria stamps shown above (Mi. #838-53, Sc. #500-15) began appearing in December 1947, continuing through February 1948. On November 21, 1947, the Austrian Schilling was re-valued. Coins were not impacted by the new currency, but new banknotes were issued, with the new Austrian Schillings being valued at three of the older Austrian Schillings. 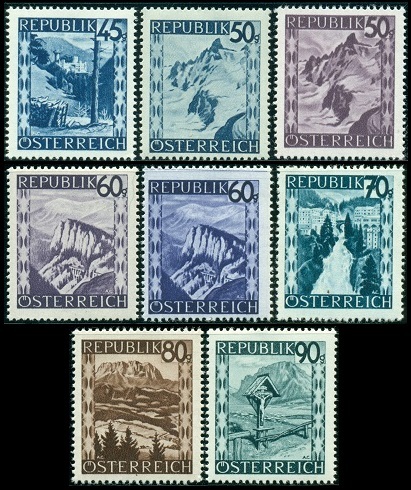 To reflect the currency re-valuation, some of the Landscape definitive stamps were re-issued in new colors, indicating that they were valued in the new Schilling currency. All of the Groschen denominated stamps were printed in orange red, and all of the Schilling denominated stamps were printed in dark violet. They are all shown above. These new stamps were not in use very long, as they were replaced by the new series of Regional Costume definitive stamps, beginning in June 1948. There are many plate and printing varieties on almost all of the stamps shown on this page. Please see the specialized Netto and Michel catalogs for details. 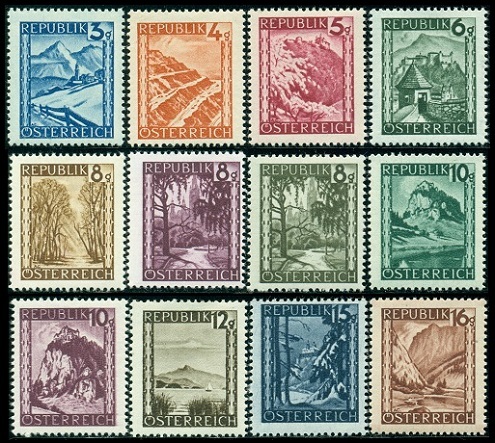 On September 1, 1947, two of the landscape definitive stamps of 1946 were overprinted and revalued, as shown above (Mi. #835-36, Sc. #492-93). 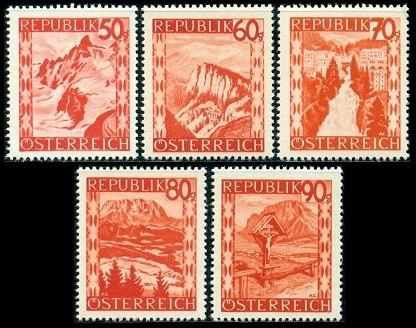 The overprints range in color from black to red brown.